On a PC running Windows 10, when you delete a file by choosing a file and hitting the Delete key, or right-clicking on file and then clicking Delete option, the file is moved to the Recycle Bin so that you can restore the deleted file to its original location at any time. Depending on the size of the Recycle Bin and number of files, your Recycle Bin might be consuming GBs of valuable disk space. To recover some space, you can manually delete all files from the Recycle Bin. 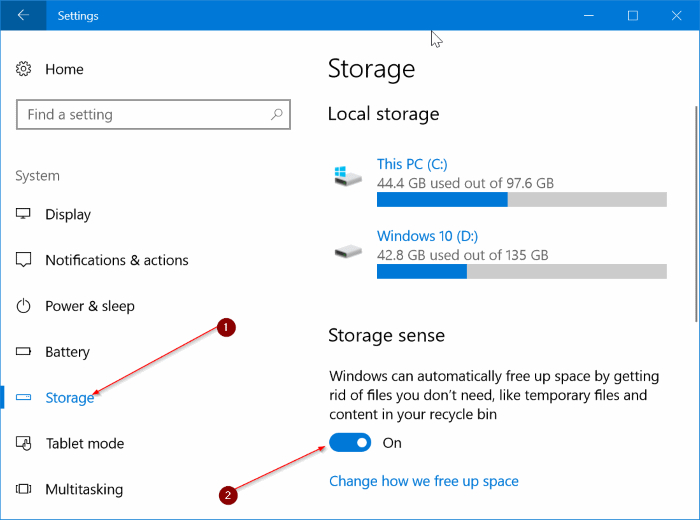 You can even disable the Recycle Bin in Windows 10, but it’s not a good idea, especially when you can free up space by deleting all files from the Recycle Bin. But why manually delete files from Recycle Bin when you can automate the job? Yes, Windows 10 offers an easy way to automatically delete older files from Recycle Bin. There is a provision to automatically delete files older than 30 days from the Recycle Bin. 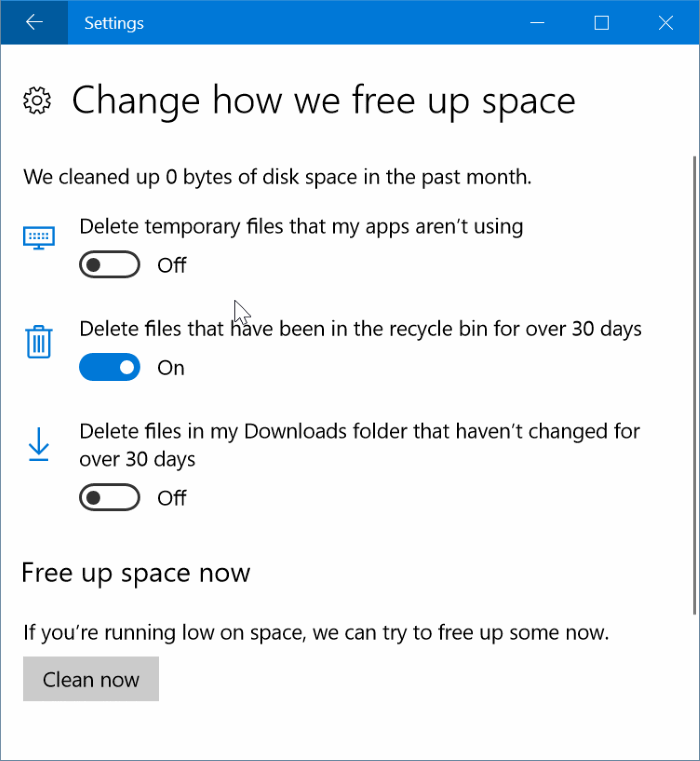 In simple words, if you delete a file to the Recycle Bin, the file will be removed from the Recycle Bin after 30 days if you turn on the new feature in the Storage settings. The feature helps you automate the job of deleting files older than 30 days from the Recycle Bin to free up space. Remember that, as long as the files are in the Recycle Bin, you can restore them back to the original location. You need to enable this new feature to automatically delete files that have been in the Recycle Bin for over 30 days. The Storage sense feature in Windows 10 allows you to automate the job of deleting files from Recycle Bin. Complete the given below directions to configure Windows 10 to automatically delete files older than 30 days from Recycle Bin. Important: Turn on the feature only if you know what you are doing. Because files deleted from Recycle Bin cannot be easily restored, you might not be able to retrieve all automatically deleted files even if you use third-party software. Step 1: Open Settings app. Navigate to System > Storage. Step 2: In the Storage sense section, turn on the Storage sense feature. Now, click Change how we free up space link. Step 3: Here, turn on Delete files that have been in the recycle bin for over 30 days option. That’s it! From now on, Windows 10 will automatically delete files older than 30 days from the recycle bin. You may turn on or off Delete temporary files that my apps aren’t using, and Delete files in my Downloads folder that haven’t changed for over 30 days. You might also like to enable the delete confirmation dialog in Windows 10. This definitely helped me with getting the “recycle bin” back on the desktop, and to turn off the 30 day deadline. I deleted 2 files 2 days ago and I can’t find them. Is there a way of recovering them. They evidently did not go to the recycle bin, because it was not on the desktop.